Kitchen to Kitchen acts as the inverse to previous Visiting projects where I constructed versions of kitchens to bring to public spaces. These earlier Visiting projects  one in a large group exhibition space and the other on the streets of Belfast  utilized the familiar tools and imagery related to a kitchen to create an intimate space for conversations with strangers. Kitchen to Kitchen reverses this approach and relies on relationships with those whom I know personally. 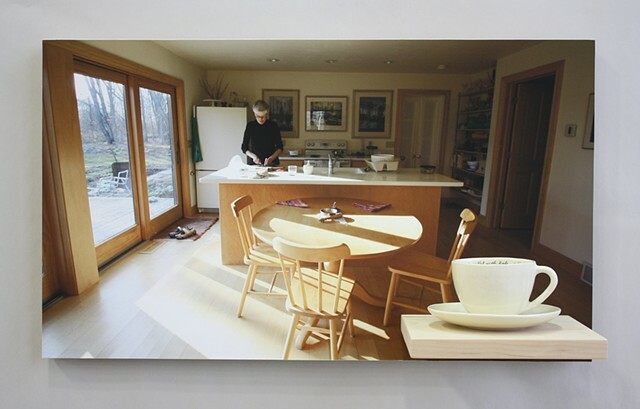 An invitation into someones home, someones kitchen, assumes a level of friendship and familiarity. In Visiting (Belfast), nearly all of the objects used were made: the dress I wore, the teacart, cloth napkins and cookies brought along for tea. This became a gesture of a host, preparing for those I would invite for conversation. In Kitchen to Kitchen I show up as a guest, bringing something to offer, but accepting the gift of conversation and food/drink provided. Each kitchen is documented via wide-angle photograph and I ask each of these friends if I may borrow one cup we have used during our conversation. I then make a mold of their cup, return it and slip-cast a replica. The interior of the cup contains text from the journal I have written after our visit. The journal records everything from what we ate and/or drank to what we discussed, this in part revealing the nature of our friendship. The cup then acts as a document of the event and conversation, as well as the style and type of vessel chosen and used by this person in their home. The conversation text on the interior of the cup acts as metaphor for the friendship and the space we leave for these conversations. Choosing a cup as the single object documentation of the event underscores the role of food/drink in the social ritual of visiting. The display of the projects documentation  the inclusion of the shelf and cup on the photo of the kitchen  subtly references the design of a personal Facebook page. The large and small images on a personal Facebook page act as curated images of identification for those with whom we are friends with in a digital space. Your home, your kitchen, and the objects you choose to use in that space as other curated images of identification, but which would be seen by only those with whom you are friends with in your everyday life.